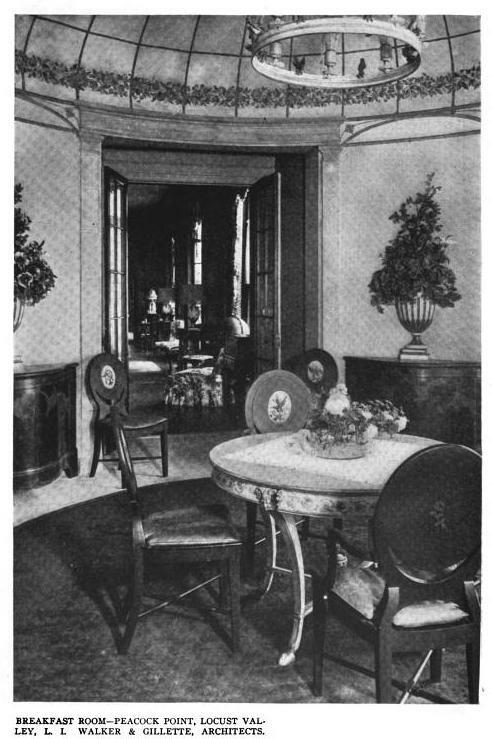 The accompanying interiors to 'Peacock Point', the Henry Pomeroy Davison estate designed by Walker & Gillette c. 1914 in Lattingtown. Click HERE and HERE for more on 'Peacock Point'. Photos from Architectural Record, 1917. At Yale, the Davisons were Skull & Bones men. Very nice, although I think sort of "homey" looking for such formal bones. 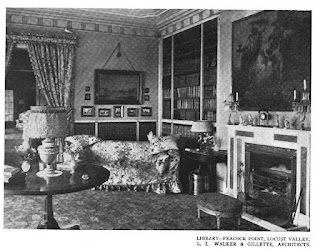 Maybe, as Ancient suggested regarding another house, the Henry Pomeroy Davisons chose their decorator based on the decorator's discretion regarding a room no magazine photographer was ever going to see? 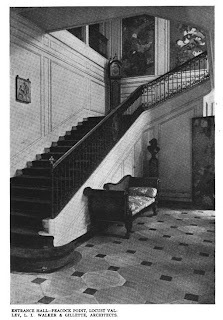 Can someone with sharper eyes than mine tell me what those paintings are on the landing of the entrance hall (the first picture above)? Presumably the chimes were off for all but one of the clocks! 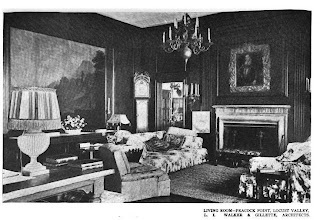 "Can someone with sharper eyes than mine tell me what those paintings are on the landing..."
HPHS, in his recent Peacock Point post, says they are "Chinese panels in full color." 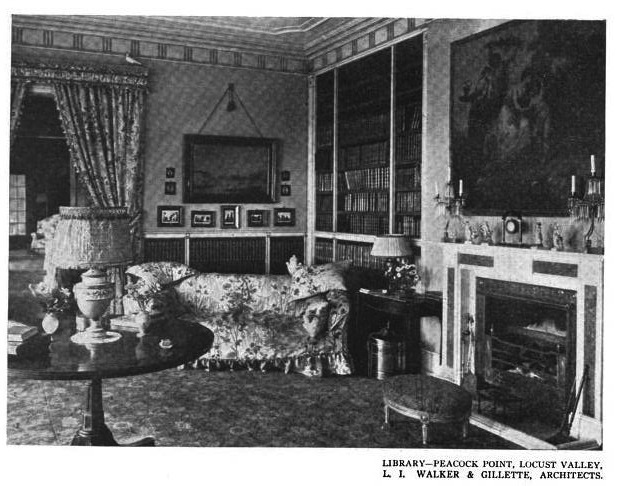 The lumpy sofa in the library with the loose pillows tossed as if an occupant just rolled off after a long nap gives an unkempt appearance to a professional photograph. 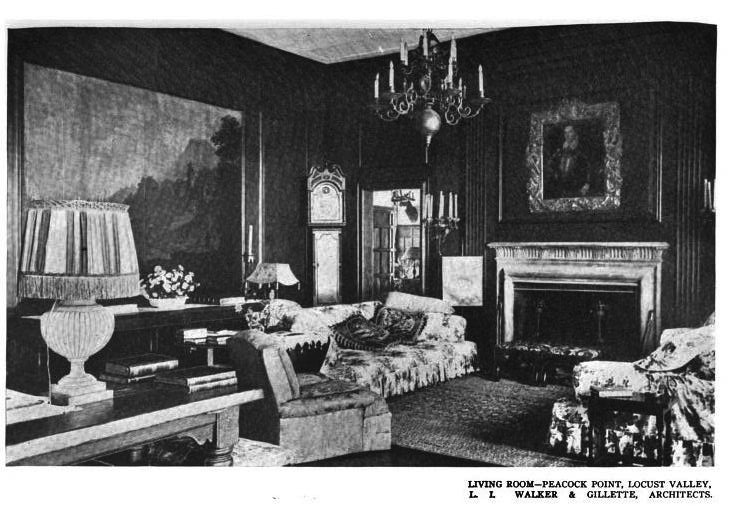 "These are the rooms of people who were sure of themselves"
I have always loved the exterior of Peacock Point. Very sad to see it gone. The lived in look is a definite "I dont care what you think" statement. Around Locust Valley it was common to spot the wealthiest neighbors since they were the ones driving the 10 year old, dirt covered station wagons with the chrome horse mounted on the hood. All the "wanna bees" were driving the shiny black Mercedes. I love the fact that so many of the pictures are large and simply framed. 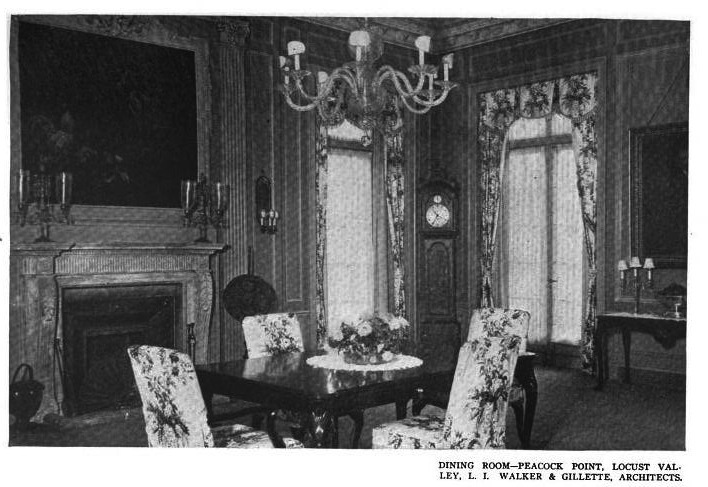 We see too many interiors where the pictures seem to have installed without much of a plan. Here, someone seems to have known just what to do and how to do it. Self-confidence, to be sure. P.S. archibuff -- If you watched that video, you know that the Davisons also had shiny black cars -- but old, terribly old. Electric, even. I was just telling someone this morning about a former boss of mine whose still preserved family money came from textile mills in Mass. He would have his suit jacket off and lean back in his big desk chair with his fingers intertwined behind his head and often the elbows would be worn out of his expensive shirts. And by "worn out" I mean worn through -- holes. And I thought only a really rich person could get away with that. Having grown up in Locust Valley (and waited on many of the wealthiest, or delivered groceries to their estate staff via the service entrances) I concur with the observations above. These people were so well bred and mannered, by and large, you would never see anyone shouting about their wealth. Good clothing worn forever and those station wagons - a Saturday morning at Britton's Hardware on Forest Avenue in LV would be the place to rub well worn elbows as many of the area's long time residents were buying nuts and bolts for repairs needed "back at the house" or a replacement part for that decades old riding mower. Thank you so much for posting the links about the Davison family history - wonderful to read about how the family lived and worked. "I love the fact that so many of the pictures are large and simply framed." Indeed. 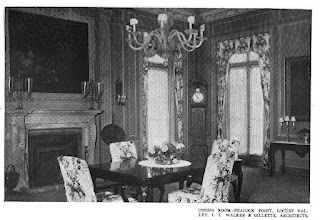 Quite possibly the panels were set directly into the boiserie over several of the mantels and, as we saw, there in the stairwell as well; that, followed by surrounding applied molding to give the appearance of a frame. I'm beginning to wonder if there might have been a theme of peacocks running throughout the wall art. Wish I could enlarge better, but no complaints intended!